Durability is an advantage with screen printed in-mold labels, due to the integration of ink, substrate and injection molding. During the SPE Decorating & Assembly TopCon, held in June and co-located with the IMDA Symposium, Serigraphs Mike Ruminski led a workshop titled Direct Digital Printing on Molded Product vs. Screen Printed IML. The advantages and disadvantages of each created a lively discussion on the best applications for these decorating methods. Below are highlights of the information that was shared. If durability is of upmost importance, would screen printed in-mold labels be a better choice than direct digital printing? Screen printed in-mold labels (IML) are more durable because of the integration of ink, substrate and injection molding  especially when using a second surface construction. This type of application encapsulates the inks and/or graphics between the substrate and the injection molded resin, which protects the words or images from environmental or chemical wear and tear. Digital printing with UV-curable inks can create acceptable durability for many applications. If the product has little to no exposure to the outside elements or the shelf life is relatively short, then direct digital printing may be acceptable. If the product will be exposed to weather and/or will have a long shelf life, then screen printed IML is a better choice. 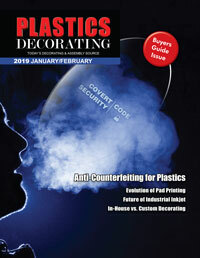 What decorating process is the more economical choice? Direct digital printing is more competitively priced for shorter run applications and for those with multiple images or graphic size variation. Direct digital printing provides the flexibility to change the graphic on every single part for customization purposes. This would not be a feasible option with a preprinted screen printed label. The cost of the screens alone would be prohibitive. Direct digital printing can place the image directly onto the molded component at 180 impressions per minute. With screen printing, the IML needs to be placed into the molding tool cavity with an end-of-arm process with mold cavitation of 24 parts per every 30 seconds. Screen printing is more economical for a large-volume formed product. Because of the multiple types of forming equipment and processes  such as vacuum forming, Neibling and Accu-forming  products with clear windows with graphics can be created in one assembly. Which is the better choice for parts with complex curves? Screen printing can create formed products containing deep draws with full coverage of inks down the sidewall of a fully decorated component. IMD/IML is an effective decorative option for parts with complex curves because the preprinted insert is formed to the shape of the finished product. For instance, based on specific types of UV inks and process manipulation, bicycle helmets can be created with draw depths of four to five inches. Although digital printing directly on the part can work for more subtly curved objects, screen printed IML is a better choice for medium- to large-sized applications. Direct digital decorating may be the better choice for complex curves on smaller sized parts. What advantages does screen printed IML have over direct digital printing? Screen printing can create chrome graphic appearances in flat and formed applications. This is an advantage over direct digital printing because the metal flakes in the chrome ink system clog the fill points in digital press equipment. In addition, screen printing can use solvent and UV ink systems on a variety of different substrates. With special types of inks, such as those developed by Serigraph, dissimilar materials can be bonded together  for instance, polyester substrate with second surface graphics to ABS injection molding resin, or polyester substrate with second surface graphics to nylon resin. Screen printing also has a larger print-to-cut tolerance than direct digital printing for flat applications. What advantages does direct digital printing have over screen printed IML? With direct digital printing, the image to be printed comes from computer-generated artwork and is sent directly to the printer. With screen printing, multiple screens must be made for each colored graphic. The direct digital printing process generates less scrap and rejects. For companies that are considering whether to add direct digital printing or screen printed IML capabilities, the capital investment is much less with direct digital printing. Screen printed IML requires additional set-up and equipment investments, although a full analysis of the specific application may still determine it is a better choice for very large, long-running applications. Direct digital printing also alleviates steps in the process of creating a finished part, since the product to be decorated goes directly from the injection molding machine to the printer, saving production time. Mike Ruminski is the senior design IML technician for Serigraph, the leader in design and manufacture of graphic appliqués for In-Mold Decorating/Labeling (IMD/IML). Serigraph can mold products in-house or provide turn-key molding. Implementing thousands of successful IMD projects, the company has the technical expertise, printing, tooling, molding technology, quality systems and global reach to deliver a wide range of applications, thereby offering a single-source solution and eliminating problems with fragmented supply chains. To learn more about flat or formed appliqués or a complete molded product, visit www.serigraph.com.